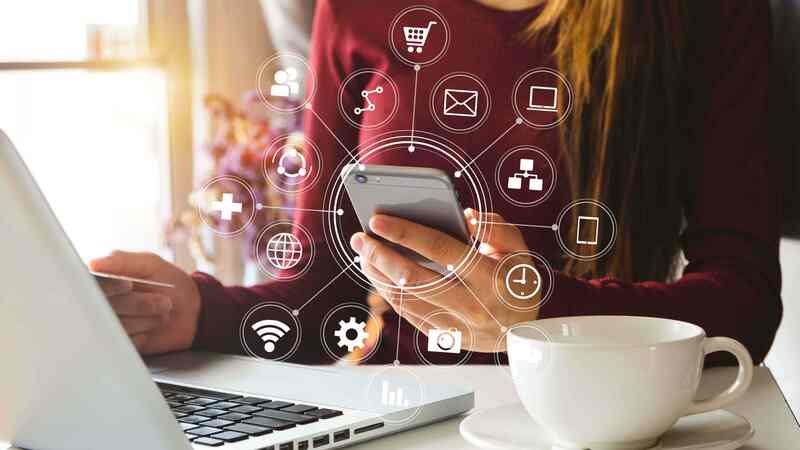 In 2019, there’s a level of expectation from consumers to receive updates and confirmations from businesses throughout the customer lifecycle journey. 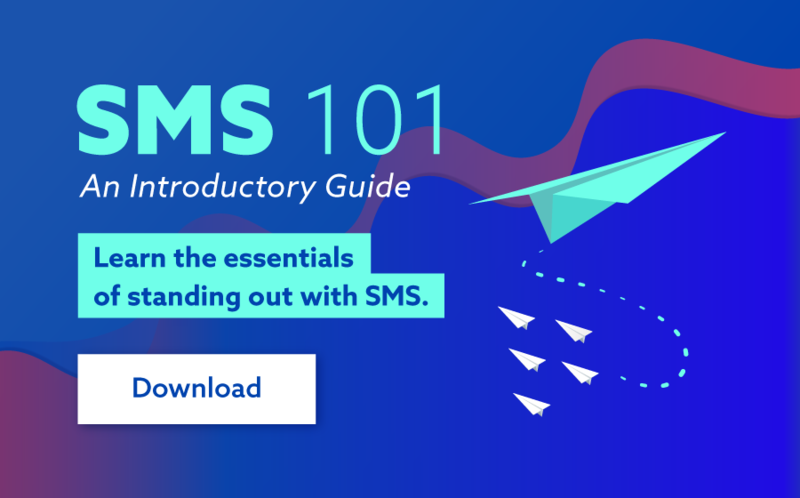 From the sign-up process to purchases and delivery, transactional messages should be sent to customers for best practice; and SMS is the perfect channel for this. Transactional SMS is ideal for delivery updates, appointment confirmations and other customer service functions. Transactional SMS refers to any text-message sent from a business to a customer that provides valuable information about their product, service or processes. Marketing material and promotional SMS campaigns are not considered transactional SMS. Transactional text-messaging is most commonly automated, in order to reduce the required human resources whilst delivering a higher level of customer service. How does transactional SMS work? Sending transactional SMS requires the use of a web SMS platform or by integrating SMS within your existing software using an API key. Online SMS software offers a simple way to send SMS communications whilst API integration can complete more complex solutions. Transactional SMS occurs when a user completes a specified action which triggers a pre-determined SMS message to be pushed to the customer. The templates sent to customers often utilise merge fields, whereby personal details or order numbers are automatically inserted by SMS software. What can transactional SMS be used for? Welcome messages - When a user signs up for an account with you (online or in-store), you can send them a welcome text to open the SMS communications channel. Order confirmations - “Did they receive my order?” “Did my payment go through?” These are common thoughts for consumers that have just made a purchase. 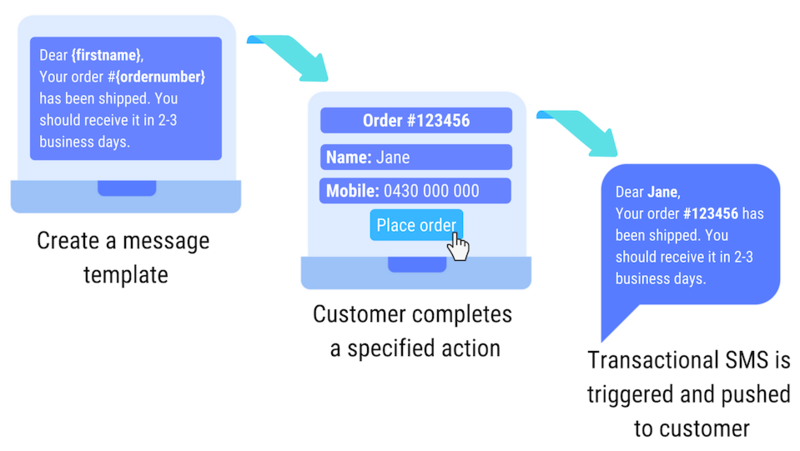 Keep your customers out of the dark by pushing order confirmations via SMS. Shipping updates - There are not many things in life that rival the excitement of receiving an online order. Help build anticipation and create a smoother delivery process by sending SMS shipping updates. Appointment confirmations - After someone makes an appointment with your business, instantly send out a confirmation via SMS that provides the booking time and location. Booking reminders - We can be all be forgetful sometimes. Help your customers remember their bookings with a friendly reminder text. This will also increase your ROI by reducing no-show rates. One-Time Passwords - The security of you and your customer’s data has never been more important than now. Send automated one-time passwords (OTPs) via SMS to your customers to verify account sign-ins, payments and more. It’s fast - Transactional SMS messages can be sent in just a matter of seconds - and are read on average within 90 seconds. The contents of these text messages are often time-sensitive, so it makes sense to send them using such a quick channel. Convenient - We love our mobile phones. So much so that 90% of adults keep their mobile device within arms-reach at all times. Transactional SMS makes life easier for your customers by communicating on their favourite platform. Streamlined - SPAM filters have almost killed off email as an effective business communications channel. Avoid these pesky filters and reach consumers directly via SMS. With open rates of 98%, it’s clear that SMS is the best channel for transactional messages. Low cost - Send transactional SMS for just a few cents each. The returns generated from improving your customer service will more than account for the low cost of sending your messages. Integratable - Our web SMS platform can be integrated within your existing software or CRM using our advanced suite of API keys. This will allow you to construct your own custom triggers for transactional SMS. Transactional messages have become a must for successful business in 2019. Improve your customer experience journey and start sending transactional SMS today. To get set up, go to www.smsglobal.com or speak to our friendly team on 1300 883 400.